Neurologists may be consulted to diagnose and treat the severe neurologic injuries that can occur in divers with decompression illness (DCI). Subclinical bubbles form during normal diving activity. DCI, a diffuse and multifocal process, results when bubbles cause symptoms by exerting mass effect in tissues, or obstructing venous or arterial flow. The lower thoracic spinal cord is a commonly affected area of the central nervous system. The most commonly described form of brain DCI is cerebral arterial gas embolism with middle cerebral artery or vertebrobasilar distribution involvement. Bubbles exert secondary damage to the vascular endothelium, causing activation of numerous biochemical cascades. Divers can develop DCI on very short dives or in shallow water, even when adhering to protocols. DCI should be strongly considered when divers experience pain after diving. 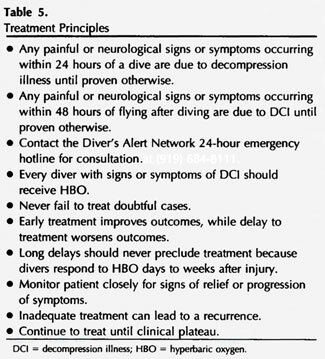 Any neurologic symptoms after a dive are abnormal and should be attributed to DCI. Even doubtful cases should be treated immediately with hyperbaric oxygen (HBOT), after a chest x-ray to rule out pneumothorax. The Divers Alert Network should be contacted for emergency consultation. Delay to treatment can worsen outcome; however, the overwhelming majority of divers respond to HBOT even days to weeks after injury. Although DCI is a clinical diagnosis, magnetic resonance imaging, somatosensory evoked potentials, single-photon emission tomography, and neuropsychologic testing help to document disease and monitor response to therapy. Divers should be treated with HBOT until they reach a clinical plateau. Complete relief of symptoms occurs in 50% to 70% of divers; 30% have partial relief. Decompression illness (DCI) is a systemic disease that can result in severe neurologic consequences. Neurologists may be consulted to assist in the diagnosis and management of injured divers. This article reviews the English literature on the diagnosis and treatment of DCI, with an emphasis on United States practice patterns. From the Department of Neurology, Louisiana State University in New Orleans, New Orleans, Louisiana and the Department of Medicine, Section of Emergency Medicine and Hyperbaric Medicine, Louisiana State University in New Orleans, New Orleans, Louisiana. 5) articles on indigenous divers or divers in developing countries. Another brief search was conducted before publication, using the same criteria. the Association of Diving Contractors (ADC) Consensus Standards for Commercial Diving Operations 4. In addition, a few studies on pathology of DCI 5-7, mechanisms of hyperbaric oxygen (HBOT) 8,9, and a historical reference 10 were included for completeness. Henry’s law states that the concentration of a gas in solution is proportional to the partial pressure of that gas interfacing with the solution 2. Because most divers breathe air, this paper will refer to nitrogen as the inert gas responsible for DCI. At sea level, the nitrogen in a diver’s tissues is at equilibrium. As a diver submerges, more nitrogen enters the tissues in proportion to the partial pressure of nitrogen. Deeper dives result in greater partial pressures, hence greater nitrogen loads. (The partial pressure of oxygen in tissues also increases, but oxygen is rapidly metabolized. As a result, increased oxygen in tissues typically doesn’t contribute to clinical DCI.) After long periods at depth, nitrogen reaches a new equilibrium and tissues become saturated. Because it is not metabolized, inert gas can only be removed by diffusion or blood flow 11. Analogous to opening a bottle of champagne, dissolved nitrogen can form bubbles when a diver surfaces (Figure 1). Scheduled decompression stops are designed to allow desaturation of tissues in order to minimize bubble formation and prevent clinical decompression illness. According to Boyle’s law, there is an inverse relationship between the pressure and volume of a gas (Figure 2) . Barotrauma occurs because non-communicating gas spaces within the body are subject to Boyle’s law 12. Middle ear and sinus barotrauma are common examples (Figure 3). Pulmonary barotrauma in divers results when expanding air is unable to escape through airways and ruptures into one of the following sites: 1) pulmonary venous system, causing arterial gas embolism (AGE) (Figure 4); 2) perivascular sheaths, causing mediastinal emphysema; or 3) the pleural cavity, causing pneumothorax 13. AGE can also result from over-distension of emphysematous blebs. Surfacing after breathing compressed air in water as shallow as 1 m can result in pulmonary barotrauma 14. In fact, the risk of AGE is greatest near the surface because the greatest gas volume changes occur near the surface; a bubble at 99 feet will double in size at 33 feet, and then double again at surface. Residual nitrogen and/or bubbles become especially important when the diver makes a subsequent dive, or flies within the next 24 hours. According to Henry’s law, an additional dive adds to the existing nitrogen load in the body. According to Boyle’s law, flying causes bubbles to expand because the cabin pressure in a commercial airline is only 8000 feet 15. [Figure 1] According to Henry’s law, the concentration of a gas in solution is proportional to the partial pressure of that gas interfacing with the solution. Henry’s law governs the uptake of nitrogen in a diver, which can result in bubble formation due to inadequate elimination of inert gas after a dive. Decompression sickness (DCS) results from formation of bubbles in the tissues or circulation as a result of inadequate elimination of inert gas after a dive. Originally, DCS was divided into mild Type I (pain only, skin, or lymphatic) and serious Type II (cardiopulmonary or neurologic). AGE is caused by entry of gas bubbles into the arterial circulation, typically resulting from pulmonary barotrauma 1. Clinically, there is significant overlap. For example, a diver with joint pain (Type I DCS) as the only complaint can develop spinal cord symptoms (Type II DCS) hours after presentation. In addition, it may be difficult to distinguish between cerebral or spinal cord symptoms resulting from inadequate elimination of nitrogen (Type II DCS) versus arterialization of bubbles (AGE). A diver may present with joint pain (Type I DCS) and spinal cord symptoms (Type II DCS) due to inadequate elimination of nitrogen and also have pulmonary barotrauma resulting in cerebral symptoms (AGE). The term Type III DCS has been proposed 16 to describe a situation in which a diver has symptoms of CAGE and severe cerebral and spinal DCS. However, this term has never been well accepted. Decompression illness involving bone-dysbaric osteonecrosis-is often a chronic condition and considered a separate entity. The term decompression illness (DCI) 17,18,19 has been proposed to encompass Type I DCS, Type II DCS, and AGE. 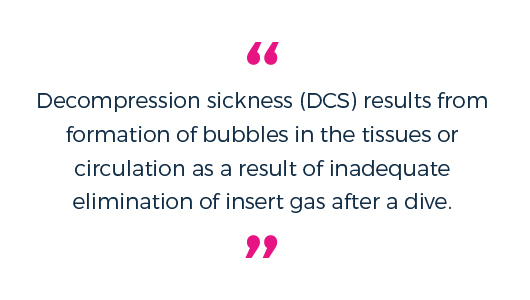 This paper will use the term decompression illness (DCI) to encompass all of the clinical signs and symptoms resulting from bubbles in the tissues and/or circulation as a result of diving. [Figure 3] This commercial diver experienced barotrauma due to helmet squeeze (negative pressure causing suction) after rapid descent to approximately 20 feet of sea water. In addition to chemosis and hemorrhage into facial skin, the patient also had sinus squeeze with hemorrhage in the maxillary sinuses. Recent estimates reflect that the number of sport divers in the United States is approximately 5 million; several hundred thousand new divers are trained annually 20. The prevalence of diving accidents is extremely variable, depending on the diving population studied. In addition, it is likely that all reports underestimate the incidence of DCI because divers either do not recognize the symptoms, or do not report them for various reasons. However, the sport diving literature indicates that in warm water, 13.4 cases of DCI and 1.3 fatalities occurred during 100,000 dives. In addition, the prevalence of “undeserved” DCI was 2.7/100,000 dives among healthy, physically fit divers that follow the published diving tables 21. Although the units are different, in cold, deep water, the prevalence of accidents and fatalities was 10.5 and 2.9 respectively in 100,000 divers 22. The prevalence of untoward events was higher among commercial divers 23,24 and submarine escape trainees 25. The largest database on civilian diving accidents is maintained by the Divers Alert Network (DAN). 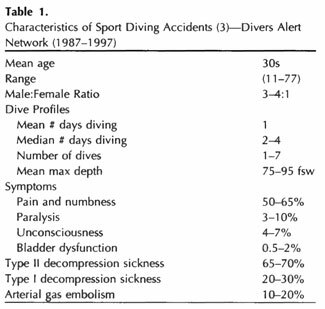 It is extremely useful in that it characterized nearly 5000 sport diving accidents from 1987 to 1997 (Table 1), using the original nomenclature. In addition to the injuries, from 1970 to 1998, there were between 66 and 147 diving-related fatalities per year 3. Eighty percent of decedents were male with a mean age of 38 to 42 years. Causes of death were as follows: drowning (50-70%); cardiovascular factors (6-14%); arterial gas embolism (5-14%); and DCS (0-2%). [Figure 4] Shows a fatal arterial gas embolism in a diver who was brought to surface after running out of air at 200 feet of sea water. 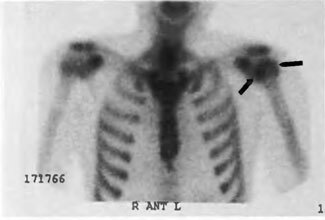 Black arrows mark air casts of the aorta, axillary, carotid arteries, and left ventricular outflow tract. Host factors, environmental factors, and equipment failures or improper technique 1-3,23-26 can predispose a diver to DCI (Table 2). 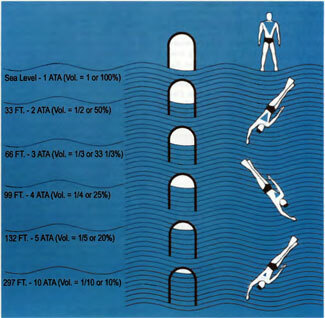 Dive profiles, in particular, are a modifiable risk factor. Previously, it was believed that a diver must be exposed to a certain minimum depth before bubbles could form (as a result of inadequate elimination), and that a diver could spend an unlimited amount of time at shallow depths (~30 feet of sea water). However, it is now known that bubble formation can occur after shallow dives and it is inappropriate to exclude the diagnosis of DCI based on a perceived minimum depth 11. Even when a diver follows the decompression tables, excess nitrogen remains for hours after a dive 29. In fact, Doppler studies have determined that up to 10% of remaining nitrogen is released as bubbles after a normal dive 20. Initial effects of bubbles are mechanical-they cause mass effect in tissues, obstruct venous outflow, and occlude arteries. In addition to causing damage at the final resting place, bubbles injure the vascular endothelium while in transit. Secondary biochemical effects include activation of leukocytes, platelets, complement, and the clotting cascade. In addition, attachment of polymorphonuclear cells and granulocyte- mediated reperfusion injury may occur. An increase of vascular permeability leads to hemoconcentration. In the brain, microvascular flow, cerebral perfusion, and autoregulation are disturbed; breakdown of the blood-brain barrier, and extension of the ischemic penumbra can occur 1,11,30. DCI is a spectrum. At one end, patients may experience mild or nonspecific symptoms, such as fatigue, malaise, and a sense of foreboding. This may be a prodrome to more severe manifestations of DCI 20. Symptoms may be so mild that divers do not seek treatment 31. At the other end of the spectrum, patients can experience severe cardiopulmonary or neurologic symptoms 1 resulting in death. “Undeserved” DCI can occur in divers whom strictly adhered to the decompression tables 1. Denial and minimization of the symptoms by divers is extremely common, even among professional divers trained to recognize the signs and symptoms of DCI. One study reported that divers had an average delay of 32 hours before calling for assistance in cases of DCI 15. A description of limb pain, cutaneous and lymphatic, cardiopulmonary, spinal cord, and brain DCI follows. Limb-pain DCI commonly results from autochthonous (originating in the place where found) bubble formation in the musculoskeletal system 1. Peri-articular spaces and tendons are poorly perfused, saturate and desaturate slowly, and are vulnerable to bubble formation. The characteristic extremity or joint pain of DCI usually has a gradual onset and presents as a deep dull ache that ranges from mild to excruciating in intensity. It typically affects the upper extremities and is asymmetric. Common locations include the shoulder, elbow, wrist, hand, hip, knee, and ankle. Although it is nonradiating, muscles around the joint may ache 1. Present at rest, it may or may not be exacerbated by movement, and is not accompanied by redness, swelling, or tenderness 15. DCI can also involve bone because the fatty marrow of long bones has poor perfusion and increased nitrogen solubility. Bubbles forming there cause pain, intramedullary venous stasis, activation of the clotting mechanism, damage to marrow adipocytes, ischemia, and necrosis of bone 32. Dysbaric osteonecrosis can be asymptomatic and is often a late finding, occurring months after the acute injury. Pain that is radicular in nature, in a girdle distribution, or consists of visceral pain in the abdominal or thoracic areas strongly suggests spinal cord involvement 1, and can be the forerunner of severe neurologic presentations 12. Although uncommon, bubbles can cause clinical signs and symptoms in the skin or lymphatic system. Cutaneous DCI is often associated with a right-to-left shunt 33, but can also result from inadequate elimination of gas. Symptoms include an intensely pruritic rash with marbelization (cutis marmorata) that progresses to a red, patchy, or blue discoloration of the skin 1. It often occurs on the shoulders and upper thorax 15. Lymphatic obstruction can also occur 1, manifesting as peau d’orange 20 or pitting edema 15. Despite a load of venous bubbles, divers may remain asymptomatic because pulmonary capillaries are an effective filter. “Chokes,” a severe form of DCI, can occur when venous bubbles overwhelm the pulmonary circulation. Symptoms range from mild cough and chest pain to cardiopulmonary arrest 1. Spinal cord white matter is particularly vulnerable to autochthonous bubble formation (Figure 5), because nitrogen is highly soluble in myelin and it has poor collateral blood supply 7. Spinal cord DCI can also occur when bubbles obstruct arterial or venous flow 1. The lower thoracic spinal cord is the most commonly affected area, followed by lumbar, then cervical 15. Pathologic changes may be microscopic and diffuse or consist of focal areas of necrosis. In severe DCI, acute changes include grossly distended empty blood vessels found in the meninges, nerve roots, and white matter with occasional perivascular hemorrhage and perivascular proteinaceous globules (indicating vasogenic edema). Chronically, degeneration of the posterior columns, posterior roots, bilateral tracts of Lissauer, and anterior columns has been demonstrated 6. Cerebral AGE is the most widely described mechanism of brain injury in diving. AGE typically results from pulmonary barotrauma, but can also occur when venous bubbles overwhelm the pulmonary filter or bypass it by way of a right-to-left shunt. Cerebral AGE results in occlusion of arteries; the middle cerebral artery and vertebrobasilar distributions are commonly affected 1. A large volume of gas can result in a typical stroke. However, gas bubbles can disperse until they obstruct small arteries with an average diameter of 30 to 60 µm 30. Instead of remaining spherical, they become cylindrical. Bubbles may become lodged in the small arterioles of the cerebral circulation for only a brief time, yet produce delayed reduction in cerebral blood flow and deterioration in neural function 11. The onset of symptoms of severe cerebral AGE is typically sudden and dramatic, occurring at the time of surfacing. However, a mild case of AGE may present later, because pain can be a distracter, and neurologic symptoms can surface later in the course 1. A diver who surfaces unconscious is presumed to have brain DCI resulting from cerebral AGE, however near-drowning can be difficult to differentiate, and may coexist 27. In the brain, the neuropathologic changes of DCI are often subtle and diffuse without large areas of necrosis. In acutely deceased divers, microscopic changes include dilated empty arteries and veins in white matter; diffuse perivascular hemorrhage, small areas of focal necrosis in gray matter, and vacuolation of myelin. In an uncontrolled pathologic series, chronic changes were detected in young (aged 19 to 36) normotensive divers, with no prior history of DCI. Lesions involved predominantly white matter perivascular lacuna formation and hyalinization of vessel walls 5. Autochthonous bubble formation in the brain has not been convincingly demonstrated in human pathologic studies 7. Although venous bubbles have been demonstrated in pathologic studies, most textbooks and papers do not mention this mechanism of brain DCI. DCI can affect the inner ear, resulting in vertigo; however, several other conditions associated with diving can result in vertigo (see Differential Diagnosis of DCI). Overall, neurologic DCI is a diffuse multifocal disease 15, and attempts to localize the lesions may be impossible. Table 3 2, which uses the original nomenclature, demonstrates the multitude of different etiologies that can be associated with a single clinical sign or symptom. 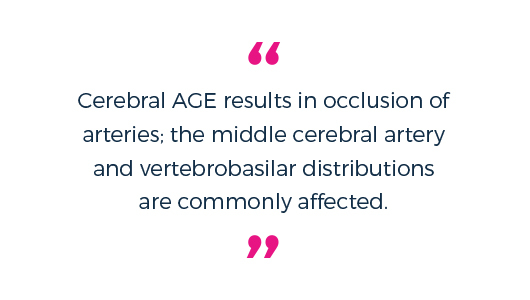 Cerebral AGE results in occlusion of arteries; the middle cerebral artery and vertebrobasilar distributions are commonly affected. Mild signs and symptoms of DCI such as pain can mask more serious symptoms such as confusion. Therefore, the examiner must be diligent in searching for neurologic signs and symptoms, and monitor the patient carefully for any sign of clinical deterioration. The occurrence of any neurologic sign or symptom after a dive is abnormal and should be considered a symptom of DCI 1. The onset of symptoms can occur up to 24 hours or more after diving. Late onset of symptoms is more likely with altitude exposures after diving. A very difficult differentiation is between the limb pain resulting from DCI and a muscle sprain or bruise 1. Both can occur simultaneously. A traumatic injury incurred while diving can predispose the diver to DCI because the injured tissue may be poorly perfused due to edema or damaged vasculature. If there is any doubt as to the cause of the pain, the physician should assume that the patient has DCI and treat accordingly 1. Symptoms of nonpulmonary barotrauma are common among divers and may mimic DCI 14,15. The differential diagnosis of vertigo includes round or oval window rupture, tympanic membrane rupture with cold water in the middle ear, and altemobaric vertigo. History may be helpful, because inner ear or brain DCI usually occurs after leaving the water, or at least on ascent. Barotrauma almost always occurs on descent, and is precipitated by rapid descent without equalizing pressure, or too forceful Valsalva on descent. Altemobaric vertigo occurs on ascent or descent when unequal middle ear pressures result in asymmetric vestibular stimulation 20. The differential diagnosis of headache in divers includes DCI, sinus, otologic, or dental barotrauma, and mask squeeze. Tension headaches, neuralgias, and temporomandibular joint (TMJ) dysfunction can result from poorly fitting equipment 34. Carbon dioxide retention can occur in divers whom breath-hold or hypoventilate. Hypercapnia can result in cerebral vasodilatation and increased intracranial pressure and vascular headache, as well as other central nervous system (CNS) symptoms. Although rare, carbon monoxide can contaminate a diver’s air supply, leading to severe headache and other systemic and CNS symptoms. Other causes of headache in divers include benign exertional headache, cold-stimulus headache, and intoxication due to hazardous marine life. The distinction between DCI and headache due to benign causes may be difficult. In addition, a severe headache can distract a diver from following proper diving procedures. If there is any uncertainty, the diver should be treated with HBOT. Other breathing gas disorders such as hypoxia, hyperoxia, hypocarbia, nitrogen narcosis, and high pressure nervous syndrome can result in CNS symptoms or complicate treatment 1. DCI is diagnosed clinically; there are no lab values that can help to exclude the diagnosis. However, complete blood counts and basic chemistries should be performed along with clinical examination to assess the patient’s fluid status. To rule out rhabdomyolysis, creatine kinase (CK) levels should be performed in divers who dove in rough seas, experienced severe exertion, or hypothermia. In addition, elevated CK, transaminases, and lactate dehydrogenase levels have been demonstrated in divers with DCI in general and AGE in specific 35,36. Toxicology screening should be performed, because substance abuse can contribute to the development of DCI. 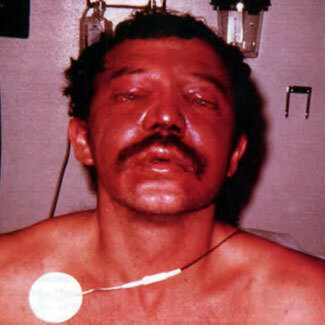 Cocaine use in particular can increase the likelihood of an oxygen toxicity seizure 2. Authorities in diving medicine believe that a thorough neurologic examination is more discerning of neurologic injury than any diagnostic imaging or electrophysiologic test 37. 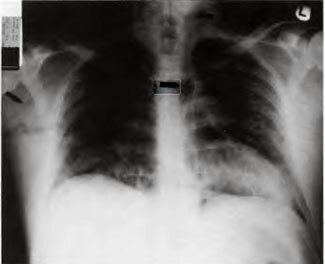 Acutely, a chest x-ray should be performed to rule out pneumothorax or pneumomediastinum before hyperbaric treatment. In general, treatment is not delayed for any other imaging studies 14. However, after initial stabilization and treatment, other diagnostic evaluations may be helpful. Ultrasound may detect venous bubbles in an acutely injured diver. However, their presence does not correlate well with clinical DCI 20; ultrasound is not useful in the management of DCI. [Figure 6] This 46-year-old previously healthy commercial diver experienced two separate incidents of brain DCI within the 30 days preceding the study. T2 -weighted brain MRI reveals multiple white matter hyperintensities, as well as a large lesion in the right frontal subcortical white matter. Previously, it was felt that brain and spinal cord magnetic resonance imaging (MRI) were insensitive to the diffuse pathology of DCI 38. However, recent case reports indicate that MRI 39-44 can detect pathologic changes in spinal cord DCI that were previously undetectable by other neuroimaging techniques. In the literature, there are six cases of spinal cord DCI imaged by MRI. MRI in these cases revealed edema of the spinal cord 40, hypointense lesions on T1-weighted images 40, and hyperintense lesions on T2-weighted images 39-44 in clinically involved areas. In some cases, it was not clear whether the initial MRI was performed before or after treatment with hyperbaric oxygen. After successful treatment with hyperbaric oxygen, edema 40 and T2 signal abnormality decreased 39,40. In the brain, T2-weighted and FLAIR sequences detected (Figure 6) lesions in six of eight patients with cerebral AGE 43 . In this particular study, all imaging was performed after initial hyperbaric oxygen therapy. In all cases, lesions (located in the white matter of the cerebrum, brainstem, and cerebellum, or gray matter of cerebrum and cerebellum) were clinically correlated with at least one of the presenting signs or symptoms. Follow-up MRI in two patients showed resolution of generalized cerebral edema and complete regression of a cerebellar hemisphere lesion. MRI was less sensitive in detecting brain or spinal cord DCI in patients with poorly localized or mild symptoms 43. Overall, MRI may be used to detect and monitor the potentially reversible lesions of spinal cord and brain DCI 41. However, a negative MRI cannot exclude the diagnosis and pretreatment with hyperbaric oxygen may obscure reversible lesions 43. Contrast enhancement and diffusion-weighted images have not been reported in the acute phase, but would likely be helpful as the pathology of DCI involves breakdown of the blood-brain barrier and ischemic changes. 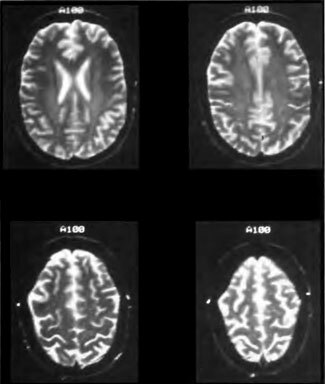 [Figure 7] (A) Transverse HMPAO SPECT brain images (performed on a triple-head Picker Pr ism 3000 with 6- to 7-mm in-plane spatial resolution) of a 24-year-old commercial diver with brain DCI. Color scale, from highest to lowest brain blood flow, is white/yellow, yellow, orange, purple, blue, and black. 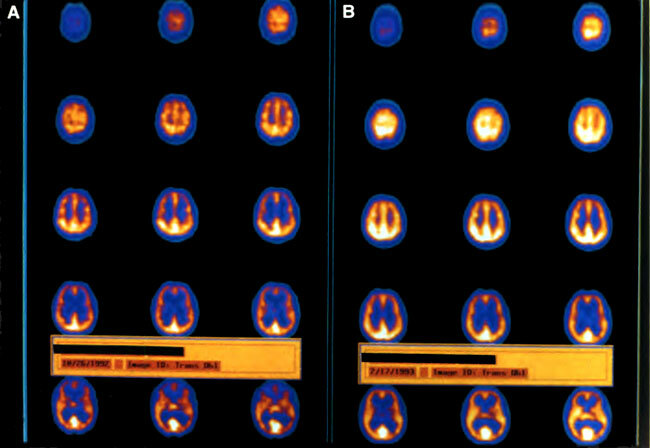 (A) Images demonstrate a diffuse heterogeneous patchy decrease in perfusion with a predominant decrease in the frontal lobes (taken 4 days after the accident and after the eighth hyperbaric oxygen treatment). (B) Images demonstrate global smoothing, increase, and improvement in brain blood flow (taken 3 months after the 23rd treatment). Single-photon emission computed tomography (SPECT) brain imaging (Figures 7-9) is a subject that has been hotly debated at diving medicine conferences. Traditionally, radiologists analyzed SPECT images for focal deficits 45. However, the pathologic lesions in DCI are typically multifocal and diffuse 5,7; radiologists had difficulty detecting this pathology 45,46. Therefore, computer analysis of SPECT was applied to detect the statistically significant perfusion deficits of DCI in five case-controlled studies 45-49. In three studies 47-49, acutely injured divers with DCI (n = 50, n = 50, and n = 20, respectively) had an increased incidence of perfusion deficits (significance levels P < 0.005, P < 0.002, P < 0.002, respectively) compared with normal non-diving controls. In two studies of chronic cases 45,46, divers with a history of DCI (n = 10 and n = 28, respectively) had significant differences in brain perfusion compared to divers without a history of DCI (P < 0.007) and non-diving controls (P < 0.005). One study reported that 12/19 divers with perfusion deficits had clinically correlated motor and sensory findings 48. Other studies 47,49 reported large lesions located predominantly in the parietal and occipital lobes (localized to Brodmann areas 6, 19, 39, and 40). Although no attempt was made to clinically correlate the lesions, authors suggested the deficits could be consistent with the neurologic and neuropsychologic deficits reported in DCI 49. Regional perfusion was reduced approximately 15% which is a smaller deficit than that seen in Alzheimer’s disease 49. Although repeat SPECT scans may show that perfusion deficits improve over time, perfusion does not return to the normal range 49. SPECT brain imaging in DCI is best used with computer-assisted analysis that employs a database of normal controls. Plain films of divers’ extremities generally do not demonstrate bubbles in the joints, and are not used in the acute management. Early bone lesions resulting from DCI can be detected on bone scans (Figure 1 0). MRI can better delineate acute injury (Figure 11), and is sensitive to chronic changes in dysbaric osteonecrosis 50. 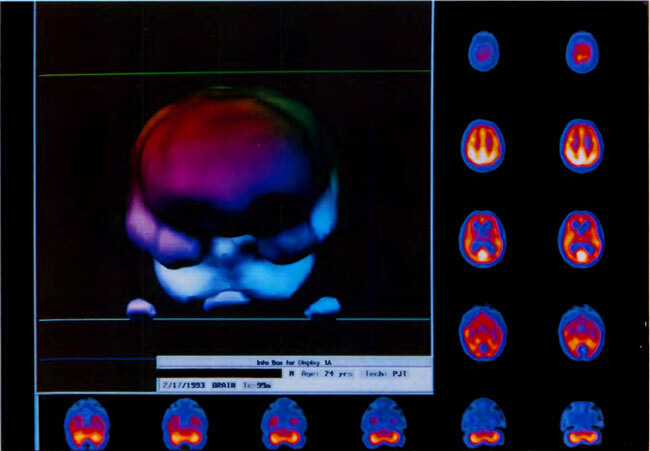 [Figure 8] Three-dimensional surface reconstruction of the HMPAO SPECT brain images in Figure 7 A. Abnormalities are reflected in coarse texture and “holes.” Color shading in the three-dimensional reconstruction is esthetic only. Somatosensory evoked potentials (SSEP) may be useful in documenting lesions in DCI. SSEP 51 latency abnormalities were found in 17 of 21 cases of acute neurologic DCI and improvement was noted in 7 of 11 cases after treatment. Electronystagmography and audiography may be helpful in distinguishing inner ear decompression sickness from inner ear barotrauma 38. A recent article showed that the electroencephalography (EEG) is clearly affected by DCI 52. Overall, EEG normality, intermittent rhythmic delta activity, and vigilance were affected, compared with controls. The beneficial effects of recompression treatment were obvious and resulted in a reduced number of abnormal EEGs; the opposite finding was noted when no treatment was provided. Nevertheless, authors concluded that an abnormal EEG alone is too common to make conclusions ofbrain damage. Neuropsychologic testing is a valuable adjunct in determining patient response to treatment and need for follow-up treatments 38. 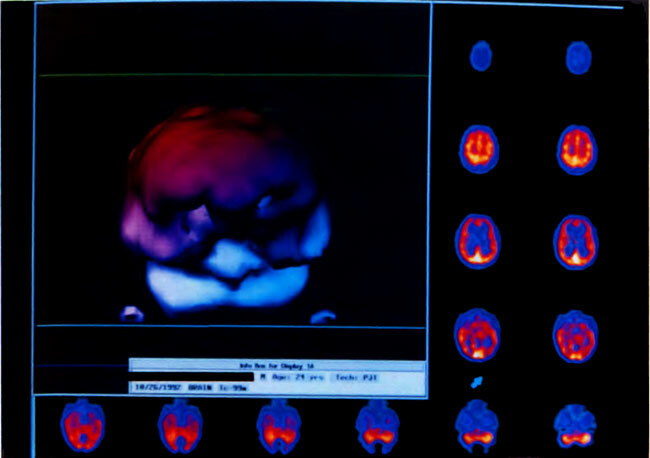 [Figure 9] Three-dimensional surface reconstruction of the HMPAO SPECT brain images in Figure 7B. Note global smoothing and “filling-in” of defects. Field management of the injured diver includes immediate administration of 100% oxygen 11,37,38. This decreases plasma nitrogen concentration and the volume of bubbles 20. Although symptoms can resolve with oxygen, they frequently recur 11; therefore, surface oxygen is not a substitute for hyperbaric oxygen 38. If transport to a hyperbaric chamber is delayed, patients can experience poor outcomes 20. Previously, a head down position was recommended 2 for cerebral AGE to prevent further embolization, and to augment clearance of bubbles impacted in cerebral arteries 11. However, head down position can contribute to cerebral edema 38. In a conscious patient, supine position is desirable 1,37, because the rate of nitrogen washout is greater in the supine position, than when the patient is sitting upright 14. Supportive measures include glucose-free isotonic fluids, maintenance of normothermia 38, and Foley catheterization as needed. Pain is a vital clinical indicator of response to therapy and should not be masked. The Divers Alert Network should be contacted immediately for phone consultation and the location of the nearest recompression facility. The Coast Guard can provide offshore helicopter transport as needed. Flying after diving may worsen the patient’s condition due to expansion of bubbles at altitude. If the patient is to be transported by air, this must be done at an altitude below 500 feet 37. For long distances, when helicopter transport is not viable, the patient can be transported in an airplane pressurized to 1 AT A, such as a Learjet 20. In-water recompression with oxygen has been used in remote areas, where chambers are not available. The diver receives hyperbaric oxygen therapy by re-submerging and breathing pure oxygen. Its use is not recommended in areas where hyperbaric chambers are available 1,38. Transportable chambers exist, which are lightweight and can be pressurized in the field. Although their use is not widespread, they have been used in evacuation and transportation of divers to a hyperbaric facility 38. [Figure 10] Shows a bone scan of a sport diver with limb-pain DCI refractory to treatment. 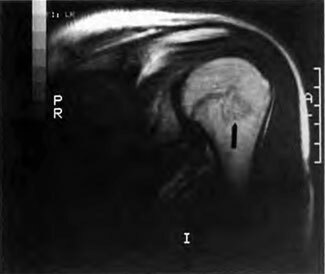 The image shows increased tracer uptake in the left humeral head. In 1889, during construction of the Hudson River tunnel, 25% of caisson workers died of DCI. Moir, an engineer and the superintendent of construction, was the first to treat patients with hyperbaric recompression. Men who were unconscious or paralyzed had immediate improvement- even in severe cases they appeared to be cured. After implementation of hyperbaric therapy, only 1.6% of caisson workers died over 15 months 10. Hyperbaric recompression (air was initially used, oxygen was implemented later) has been the standard of care for DCI since the 19th century. There has never been a randomized controlled clinical trial demonstrating the benefit of hyperbaric recompression (Figure 12) over placebo. 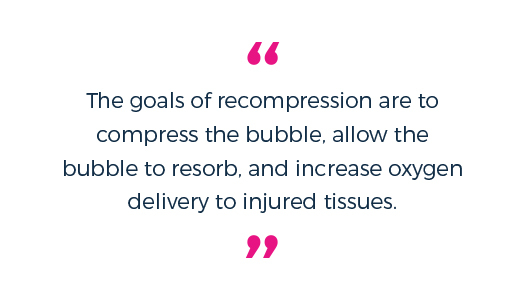 The goals of recompression are to compress the bubble, allow the bubble to resorb, and increase oxygen delivery to injured tissues 1. As bubbles shrink, they progress through the circulation and are filtered out by the pulmonary capillaries. Hyperbaric oxygen is often administered over 4 or more hours, as bubble elimination may be slow in areas of poor flow in which platelet and polymorphonuclear cell sludging, and edema may have occurred 20. 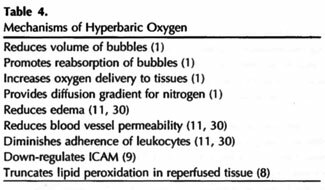 In addition to the purely physical effects on bubbles, HBOT ameliorates the ischemia-reperfusion injury (Table 4). The standard of care varies, depending on the diving population, type of chamber, gas mixtures available, and expertise of the physicians and technicians (see Table 5 for treatment principles). In general, professional divers engage in deeper dive profiles with longer bottom times, compared to sport divers. As a result, they have greater inert gas loads. In addition, any residual neurologic deficit can end a professional diver’s career 38; therefore, more aggressive therapy is often required. Most military and commercial diving standards require a multiplace chamber 1,4 and have the means to conduct deep treatments that may last several days. Treatment protocols are dictated by close monitoring of the patient with neurologic examination in the chamber. Divers typically experience immediate relief of symptoms upon recompression. If pain and/or neurologic deficits do not disappear or respond significantly within 10 or 20 minutes, algorithms call for deeper and/or longer treatments. Recurrence of symptoms upon surfacing may also necessitate deeper or longer treatments. Many community-based facilities that treat sport divers do not have the infrastructure to perform military or commercial diving protocols (See Table 6 for an outline of basic treatment tables) 1-4, 11, 30, 37, 38, 53). According to Divers Alert Network data, U.S. Navy Treatment Table 6 (Figure 13) was used for initial treatment in approximately 75% of sport divers with DCI. This is an appropriate starting point; extensions (additional oxygen breathing periods) at 60 or 30 feet can be administered as needed in severe or refractory cases. Use of tables deeper than 60 fsw should be reserved for facilities with the experience, expertise, and hardware necessary to deal with untoward responses 38 . Patients with severe neurologic DCI that is refractory to treatment with U.S. Navy Treatment Table 6 can be transported to a tertiary care center for delayed treatment with deeper tables 3,7. Many adjunctive therapies, including corticosteroids 3,30,37,38, NSAIDs 37,38, heparin, anticoagulants 30,38, and lidocaine 3,30,37,8,54 have been attempted, but none have become the standard of care for DCI (Table 7). [Figure 11] MRI of the left shoulder of the diver depicted in Figure 10 confirms DCI of the bone. Complete resolution is most likely to result from early hyperbaric treatment 38. However, delayed presentation is common among sport divers. The DAN data 3, based on thousands of cases from 1987 to 1997, reveals that mean delay to recompression was 40 to 50 hours; delays of 4 days or longer were common. Outcome data for the year 1998 (n = 414) indicates that despite the fact that over half of the divers were treated 24 hours after injury, the overwhelming majority responded to treatment. Because the window of opportunity for treatment is unknown 14, the decision to treat should not be based on an arbitrary time period 38. DCI should be treated, even days to weeks post injury 30. The pathologic target at this point is not completely clear, but could be persistent tissue bubbles, ischemia, and edema or inhibition of leukocyte binding to endothelium 11. For persistent neurologic symptoms, treatment should be continued until no significant improvement occurs on two consecutive treatments. Most divers receive between 5 and 10 treatments; however, a minority, with severe residual neurologic injury may require 15 to 20 treatments 37,38. The choice of treatment tables varies. Daily treatment with U.S. Navy Treatment Table 6 or twice daily treatment with U.S. Navy Treatment Table 5 can be utilized 1,14. However, patients may not tolerate repetitive treatments at this depth due to pulmonary oxygen toxicity 1, or neurologic oxygen toxicity. Therefore, daily treatments at 45 fsw, 30 to 33 fsw, or 15 fsw can be utilized for 60 to 120 minutes 1,14,37. Possible complications of HBOT in divers include sinus or otologic barotrauma, pulmonary oxygen toxicity, CNS oxygen toxicity, temporary myopia, pulmonary barotrauma, and fire. Sinus or otologic barotrauma are rare in divers, because most divers can equalize pressure in their sinuses 20. Middle ear barotrauma is the most conm1on fom1 of barotrauma, presenting with pain. Sinus and external ear barotrauma are less frequent; inner ear barotrauma is rare. Prevention includes a combination of slow pressurization, decongestants, and patient education. Middle ear tubes may be necessary. Pulmonary oxygen toxicity may present as cough and retrostemal pain on inspiration. Air breaks are preventive and therapeutic. However, this side effect may have to be tolerated in patients with severe neurologic DCI to affect adequate treatment 1. CNS oxygen toxicity manifested by seizures occurs with a frequency of approximately 1 in 10,000 compressions. Oxygen toxicity seizures may be prevented by air breaks. 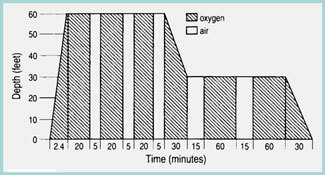 Treatment involves stopping the flow of oxygen and changing the breathing gas to air 15. Temporary myopia can result in older patients undergoing repetitive treatments due to an alteration in the lens structure 20. Pulmonary barotrauma and chamber fires are exceedingly rare in this country, and can be prevented by adherence to proper chamber protocols. Outcome depends on severity of the injury 20, as well as delay to treatment 38. Fifty to 70% of sport divers reported complete relief of symptoms; 30% reported partial or temporary relief. A very small percentage reported no relief 3. Chronic sequelae of DCI include pain, neurologic, and neuropsychologic deficits 3,14,37. After years of diving, subclinical end organ damage can occur in bone, manifesting as Dysbaric osteonecrosis. 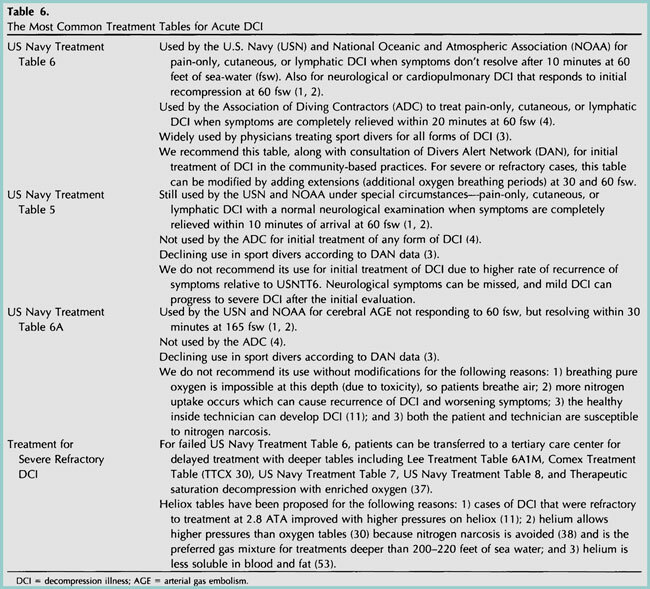 [Figure 13] U.S. Navy Treatment Table 6 is the most common treatment for sport divers with DCI. Extensions, or additional oxygen breathing periods, can be added at 60 and 30 feet of sea water as needed. Whether subclinical DCI can also occur in the central nervous system has been debated at international meetings since 1978 31. Chronic pathologic changes, including degeneration and vasculopathy in the brains and spinal cords, have been reported in divers without prior history of DCI 5,6. One controlled retrospective study 26 reported more hyperintense T2- and proton density weighted lesions on brain MRI of sport divers with and without patent foramen ovale, compared to nondiving controls. Three other controlled studies showed no differences in the number or size of brain MRI lesions 52,55,56. Although studies suggested that diving itself may have an effect on SPECT, the brain images of divers without a history of DCI were not significantly different from nondiving controls 46,47. Mental flexibility, visual tracking and scanning, and recall of nonverbal material was significantly decreased in commercial divers with no history of DCI, compared to nondiving controls 55. The authors concluded that diving may have detrimental effects on the central nervous system. Another study of military divers 56 reported significantly longer reaction times on the divided attention subtest compared to nondiving controls. However, 20 other neuropsychometric tests showed no significant difference. They concluded that there was no clear evidence of impairment in this group of military divers working under controlled conditions. Fitness to dive and return to diving after an injury are complex issues and should be left to experienced diving medicine physicians 1,2,14,23-27,57-59. We acknowledge the following for their contributions: Pat Ridge, Mandy Wise, Sylvia Cusimano, and Mary Van Meter for assistance in the preparation of this manuscript; Dr. Glenn D. Sandberg, Dr. John D. Hardman, and Dr. James L. Caruso for the photograph of the spinal cord depicted in Figure 5; and the Learning Resource Center at LSU for assistance with photography and graphic arts. U.S. Navy Diving Manual, Revision 3, Best Publishing Co., Flagstaff, AZ, 1993. (Includes all changes to July 1996). NOAA Diving Manual, Diving for Science and Technology, U.S. Dept. of Commerce, National Oceanic and Atmospheric Administration, 1991. Vann R, Uguccioni D, eds. Divers Alert Network. Report on Decompression Illness and Diving Fatalities, DAN’s Annual Review of Recreational Scuba Diving Injuries and Fatalities Based on Data. 2000 edition; Durham, NC: Divers Alert Network; 1998. Association of Diving Contractors, International. Consensus Standards for Commercial Diving Operations, Fourth Edition, 1992, Changes 2, 2000, Houston, TX. Palmer AC, Calder IM, Yates PO. 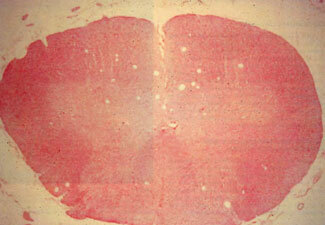 Cerebral vasculopathy in divers. Neuropathol Appl Neurobiol. 1992; 18:113-124. Palmer AC, Calder IM, Hughes JT. Spinal cord degeneration in divers. Lancet. 1987; Dec 12:1365-1366. Palmer A C. Review of the Neuropathological Effects of Decompression Sickness in Animals and Man. Engineering and Health in Compressed Air Work Proceedings of the international Conference, Oxford, September 1992. Jardine FM, McCallum RI, eds. Oxford: E & FN spon; 1995. Thom SR, Elbuken ME. Oxygen-dependent antagonism of lipid peroxidation. Free Radical Bioi Med. 1991;10:413-426. Buras JA, Stahl GL, Svoboda KK, Reenstra WR. Hyperbaric oxygen down regulates ICAM-1 expression induced by hypoxia and hypoglycemia: the role of NOS. AmJ Physiol Cell Physiol. 2000;278:C292-302. Elliot DH. Decompression sickness. In: Kindwall E, ed. Hyperbaric Medici11e Practice. Flagstaff Best Publishing Company; 1994:313. Moon RE, de Lisle Dear G, Stolp BW. Treatment of decompression illness and iatrogenic gas embolism. Resp Care Clin N Am. 1999;5:93-135. Smith DJ. Diagnosis and management of diving accidents. Med Sci Sports Exerc. 1996;28:587-590. Russi W. Diving and the risk of barotrauma. Thorax. 1998;53(suppl 2):S20-S24. Moon RE. Treatment of diving emergencies. Crit Care Clin. 1999;15: 429-456. Spira A. Diving and marine medicine review. Part II. Diving diseases.J Travel Med. 1999;6:180-198. Buder WP, Ainscough M, Penne-Casanova R. Type III decompression sickness. Aviat Space Environ Med. 1996;67:905. Neuman TS. DCIIDCS: Does it matter whether the Emperor wears clothes? Undersea Hyperb Med. 1997;24:4-5. Bove AA. Nomenclature of pressure disorders. Undersea Hyperb Med. 1997;24: 1-2. Moon RE. Classification of the decompression disorders: time to accept realiry. U11dersea Hyperb Med. 1997;24:2-4. Hardy KR. Diving-related emergencies. E111erg Med Clin North Am. 1997;15:223-239. Amess MK. Scuba decompression illness and diving fatalities in an overseas military community. Aviat Space Environ Med. 1997;68:325-333. Hart AJ , White SA, Conboy PJ , Bodiwala G, Quinton D. Open water scuba diving accidents at Leicester: five years’ experience. J Accid Emerg Med. 1999;16:198-200. Laden G, Colvin A. 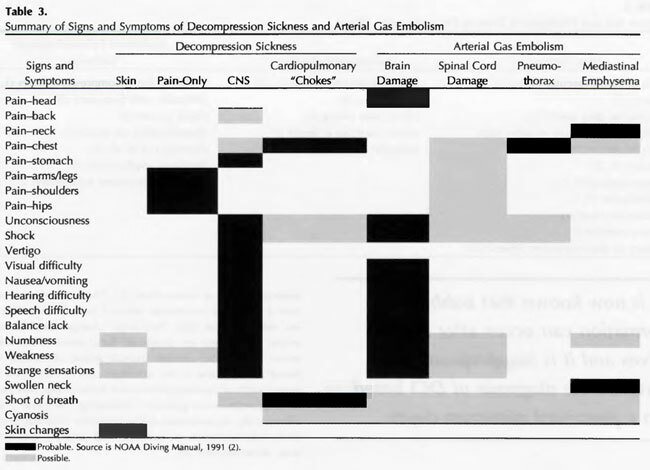 Incidence of decompression sickness arising from air diving operations. U11dersea Hyperb Med. 1998;25:237-239. Benton PJ , Francis TJR, Pethybridge RJ. Spirometric indices and the risk of pulmonary barotrauma in submarine escape training. Undersea Hyperb Med Soc. 1999;26:213-217. Schwerzmann M, Seiler C, Lipp E, et al. Relation between directly detected patent foramen ovale and ischemic brain lesions in sport divers. A1111 l11tem Med. 2001;134:21-24. Beckman TJ. A review of decompression sickness and arterial gas embolism. Arch Fam Med. 1997;6:491-494. Gerricts T , TetzlaffK, Liceni T , et al. Arteriovenous bubbles following cold water sport dives: relation to right-to-left shunting. Neurology. 2000;55:1741-1743. Gallagher TJ. Scuba diving accidents: decompression sickness, air embolism. J Fl Med Assoc. 1997;84446-451. Shank ES, Muth CM. Decompression illness, iatrogenic gas embolism, and carbon monoxide poisoning: the role of hyperbaric oxygen therapy. l11t Anesthesial Clin. 2000;38: 111-138. Wilmshurst P. Brain damage in divers. BMJ. 1997;314:689. Hutter CD. Dysbaric osteonecrosis: a reassessment and hypothesis. Med Hypotheses. 2000;54:585-590. Wilmhurst PT, Pearson MJ, Walsh KP, Morrison WL, Bryson P. Relationship between right-to-left shunts and cutaneous decompression illness. Clin Sci. 2001;100:539-542. Smith RM, Neuman TS. Abnormal serum biochemistries in association with arterial gas embolism.J Emerg Med. 1997;15:285-289. Shank ES, Muth CM. Diver with decompression injury, elevation of serum transaminase levels, and rhabdomyolysis. Ann Emerg Med. 2001;37:533-536. Van Meter K. Medical field management of the injured diver. Resp Care Clin North Am. 1999;5:137-177. Moon RE, Sheffield PJ. Guidelines for treatment of decompression illness. Aviat Space Environ Med. 1997;68:234-243. Sparacia G, Banco A, Sparacia B, et al. Magnetic resonance findings in scuba diving-related spinal cord decompression sickness. MAGMA. 1997;5:111-115. Manabe Y, Sakai K, Kashihara K, Shohmori T. Presumed venous infarction in spinal decompression sickness. Am J Neuroroentgenol. 1998;19:1578-1580. Sparacia G, Brancatelli G. Spinal cord decompression sickness. AJNR Am J Neuroradiol. 2000;20:612. Hierholzer J, Tempka A, Stroszczynski C, et al. MRI in decompression illness. Neuroradiology. 2000;42:368-370. Reuter M, TetzlaffK, Hutzelmann A, Fritsch G, Steffens JC, Bettinghausen E, et al. MR imaging of the central nervous system in diving-related decompression illness. Acta Radiologica. 1997;38:940-944. Kimbro T, Tom T , Neuman T. A case of spinal cord decompression sickness presenting as partial Brown-Sequard syndrome. Neurology. 1997;48:1454-1456. StaffRT, Gemmell HG, Duff PM, et al. Decompression illness in sport divers detected with technetium-99m-HMPAO SPECT and texture analysis.J Nuel Med. 1996;37:1154-1158. Shields TG, Duff PM, Evans SA, et al. Correlation between Tc-HMPAO-SPECT brain image and a history of decompression illness or extent of diving experience in commercial divers. Occup Environ Med. 1997;54:24 7-253. Houston AS, Kemp PM, Macleod MA, Francis TJR, Colohan HA, Matthews HP. Use of significance image to determine patterns of cortical blood flow abnormality in pathological and at-risk groups. J Nucl Med. 1998;39:425-430. Macleod MA, Houston AS, Kemp PM, Francis TJR. A voxel-by-voxel multivariate analysis of cerebral perfusion defects in divers with ‘bends’ Nucl Med Commun. 1996;17:795-798. Dickson JC, Staff RT, Gemmell HG, McKiddie Fl. An assessment of perfusion deficits in decompression illness using 99Tcm HMPAO SPECT and statistical parametric mapping. N11cl Med Collmllm. 2001 ;22:423-428. Coulthard A, Pooley J , Reed J, Walder D. Pathophysiology of dysbaric osteonecrosis: a magnetic resonance imaging study. Undersea Hyperb Med. 1996;23:119- 120. Murrison A, Glasspool E, Francis J, Sedgwick M. Somatosensory evoked potentials in acute neurological decompression illness. J Neurol. 1995;242:669-676. Sipinen SA, Ahovuo J, Halonen JP. Electroencephalography and magnetic resonance imaging after diving and decompression incidents: a controlled study. U11dersea Hyperb Med Soc. 1999;26:61-65. Shupak A, Melamed Y, Ramon Y, Bentur Y, Abramovich A, Kol S. Helium and O”)’gen treatment of severe air-diving-induced neurologic decompression sickness. Arch Neurol. 1997;54:305-311. Cogar WG. Intravenous lidocaine as adjunctive therapy in the treatment of decompression illness. Aun Emerg Med. 1997;29:284-286. Tetzlaff K, Friege L, Hutzelmann A, Reuter M, Holl D, Leplow B. Magnetic resonance signal abnormalities and neuropsychological deficits in elderly compressed-air divers. Eur Neurol. 1999;42:194-199. Cordes P, Keil R, Bartsch T, et al. Neurologic outcome of controlled compressed-air diving. Neurology. 2000;55:1743-1745. Camporesi EM. Diving and pregnancy. Semiu Perinatol. 1996;20:292-302. TetzlaffK, Reuter M, Leplow Bemd, Heller M, Bettinghausen E. Risk factors for pulmonary barotrauma in divers. Chest. 1997;112:654-659. Benton PJ. R esumption of diving after illness or injury. J R Nav Med Serv. 1998;84:14-18.